All I read on Twitter during the game Sunday night against the Melbourne Heart was people putting Sydney FC and their performance down. They won 2-1 and yet not many seemed to be happy until well after an hour when the positive feedback seemed to grow a bit. This isn’t what Sydney needs, especially from their fans. Now I’m not going to say that it was the best performance, because they made some sloppy play. But some of the play was amazing. Del Piero’s cross to seal the winner was spectacular; world-class. Their last 10 minutes were pretty damn good. They showed the fight, the courage and the will to win. And they have been getting better every game. ‏Last week Sydney came back twice to draw 2-2 with Perth. A good result for the team showing they still have the potential and the fight in them to compete in the A-League. They backed that up with Sunday night’s 2-1 win over the Heart. You can’t say, “@SydneyFC you are the worst team I have seen playing in the @ALeague in a long time” when they draw against Perth and picked up a win the following week. Now I’m pretty sure one of these guys scored the equaliser against the Heart. I mean, sure, Emerton hasn’t been playing the full 90 minutes at his potential, but he still shows often enough what he can do. And that isn’t what Sydney need anyway. Sydney needs stability within the club to help sort out its problems. Not, “They need to sell everyone and get a new squad totally, with a decent coach (Arnold) #SYDvMH,” as one tweeter stated. Sydney needs the support of its fans now more than ever. They need the encouragement and some positive engagement, something that makes the coach and players happy. Tell them they are doing something right. And I think winning is doing something right, so congratulate them for it and give some positive criticism and not foul abuse. That won’t help your club get back to the top. One person tweeted something that I half agree with” “Sydney winning cannot mask the huge problems they have.” That is true, we should not forget that Sydney FC still have problems, but them winning can help put them back on the right track. It should show Sydney supporters that their club still can win. That their club is starting to change for the better. That the people inside the club are starting to do things right. Hopefully next Saturday Sydney supporters will turn up to cheer their team on, believing that they might have it in them to beat Wellington. Something that I believe they can. I would love to see a crowd above 20,000 at that match. A sea of sky blue singing and chanting would be amazing. 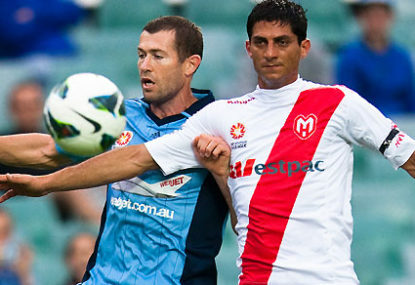 This could be the comeback of Sydney FC. Now Sydney supporters, it’s up to you. Are you going to embrace your club and help keep their momentum going? Are you going to turn up in your tens of thousands to support your club against Wellington Phoenix next week? Well, I hope you do!